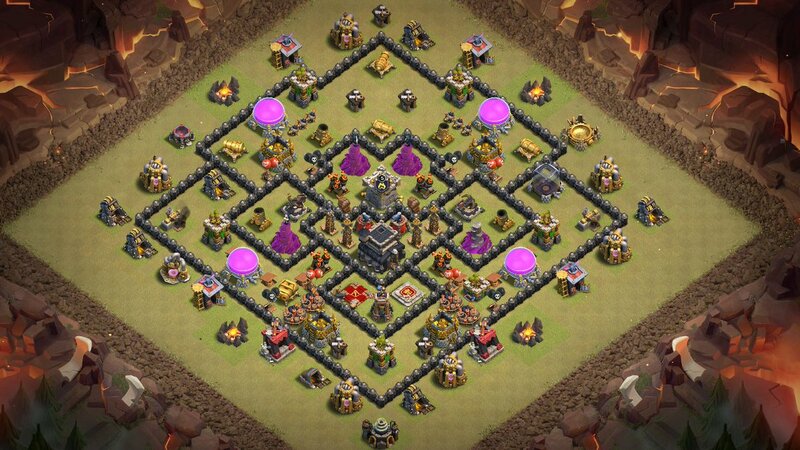 This Town Hall 9 (TH9) War Base layout is specially build to prevent LALLOON Strategy. All the Air Defenses are placed in such a way that it can cover whole base against high hit point Air Troops (Dragon, Baby Dragon, Lava Hound). To protect Air Defense from the balloons; Wizard Towers, Air Sweeper and Air Traps are well placed in this base layout. In this layout Town Hall is Heavily guarded with Archer Queen, Barbarina King, Air Defenses, Hidden Tesla, Bomb Tower and X-bows. Clan Castle is in the middle of the base, which means CC troops can not be lower out of the base. And giant Bombs are well placed in-front of Town Hall to prevent Valkyrie.